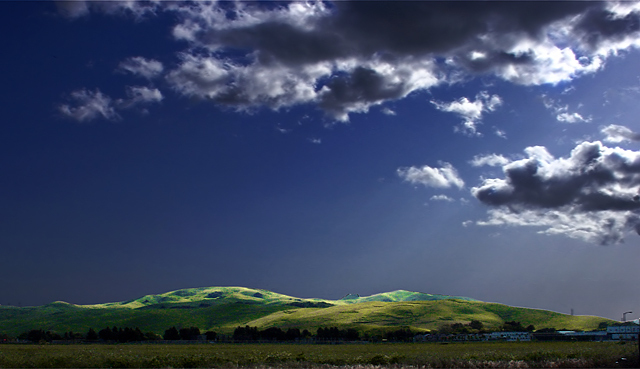 Driving home from Napa to San Jose, the sky and light were so gorgeous I pulled over and just looked for a while. I really like the color and feel of this. I stumbled on your work from your A Day in the Office picture which cracked me up. You do nice work. I love how the light and dark in the sky moves your eye from left to right and right to left....the green/blue hue of the hills is amazing. This is simply beautiful with the cool greens and blues. You're right, that sky is amazing. Great photograph, what awesome lighting. Very cool! Proudly hosted by Sargasso Networks. Current Server Time: 04/18/2019 08:19:45 AM EDT.